I need to back track a bit on this post, because I wrote my first two posts out of order relative to my entire trip. I knew I needed to write about why we traveled to Berlin and the significance of this particular visit (my older blog posts from 2012 chronicle my 2011 visit to Berlin). However, any good travel log should be somewhat sequential. Since my chosen title was the 25th Anniversary of the Fall of the Wall–which was the main purpose of this visit– I thought it would be best for the sake of my non-Brat readers to make that my initial focus. That said, let me start from the beginning of our adventure. Our original plan was to fly into Frankfurt, then take the train to Berlin. It was a great plan, because, it would allow me to share an important part of my high school experience with my family: train travel through former East Germany. As I mentioned in my last post, there was only one way out of Berlin via train and only one way out via road (although I didn’t mention it before, air travel was limited as well with special routes that could not be deviated from). We could only travel out by train at night, and only travel via car during daylight hours. [Car travel was timed and there were grave repercussions if you arrived at the next checkpoint too early or too late.] Though there were various border crossings, there were only three available to Americans– Checkpoint Alpha, Checkpoint Bravo and the infamous Checkpoint Charlie. [There were some exceptions to this– ie, if you were a diplomat’s kid, more checkpoints were available to you.] There is more detail in our book about how the Four Powers transportation agreements affected Americans, and the various ‘international incidents’ that involved American youth at these checkpoints and border crossings. Well, two days before we were due to fly to Berlin, we were informed by Jeri Glass, the president of our alumni association (Berlin Brats Alumni Assoc) . that there was a huge rail strike in Germany! Thankfully, we had vacillated so long on whether to buy tickets in the country or before we left, that we were saved from losing money on train tickets. However, this left us in a lurch, because, we had already bought tickets to fly into Frankfurt. One of the (many) things I love about being a Berlin Brat is that we Brats help each other out. It’s an incredible network, despite the fact that most of us never actually knew each other IN Berlin (more about that later). Ultimately, we ended up getting a ride with a classmate who lives outside of Frankfurt. Love this sign Bill made for us at the airport! It was Providential the way it all worked out. My husband Ivan was asked to DJ the reunion’s dinner dance. Since he could not bring his equipment, he needed someone in-country to coordinate the equipment rental. Jeri put him in touch with one of her classmates, Bill P., class of ’71. When Bill heard about the strike and that we were going to be stranded in Frankfurt, he graciously offered to pick us up and drive us all the way to Berlin! 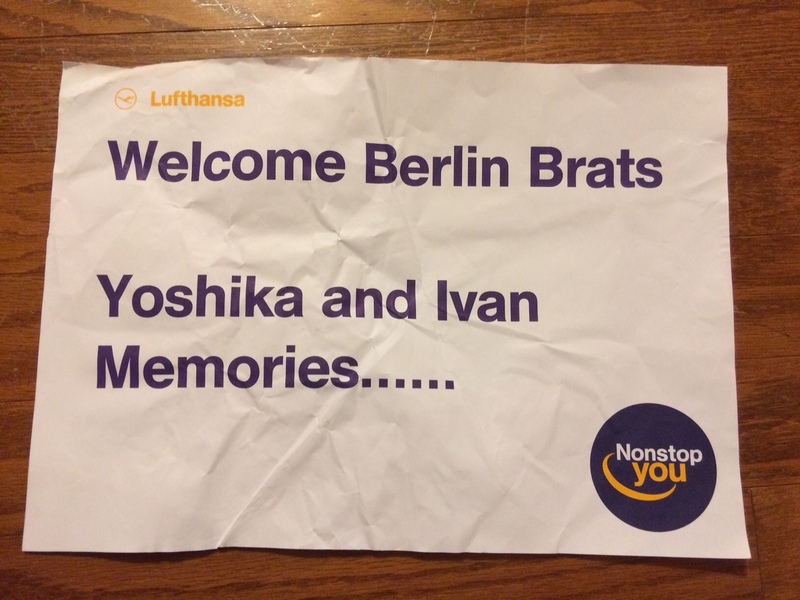 It was very, very kind of him, because even though we are Berlin Brats, we had never met him before. Bill was a life saver! Ultimately, this meant we drove the autobahn to Berlin like the old days, but in this case, we were allowed to stop along the way (we even had lunch at a Gasthaus! ). During the Cold War, crossing the Inner German Border was a stressful and scary ordeal. I could not believe I was riding through the former East– unhindered, untimed and unthreatened by armed Russian border guards. There was even a sign at one point along the autobahn that marked where the former Inner German Border began. Unfortunately, this meant that my two youngest kids, who were still in college, would have to catch a local German airline to get from Frankfurt. 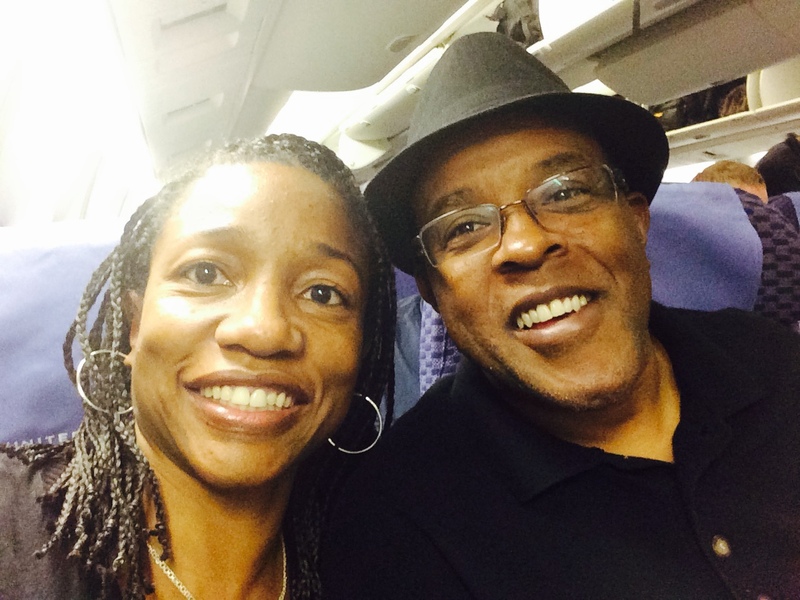 Their class schedules had prevented them from flying out on the same day as us. We arrived in Berlin in the late evening, and checked into the flat we’d rented in the former East. 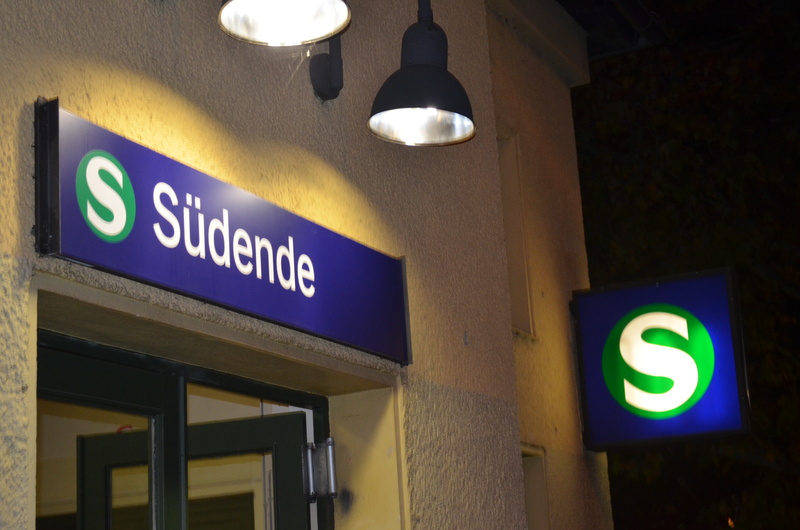 It was right next to the Südende S-Bahn Station. 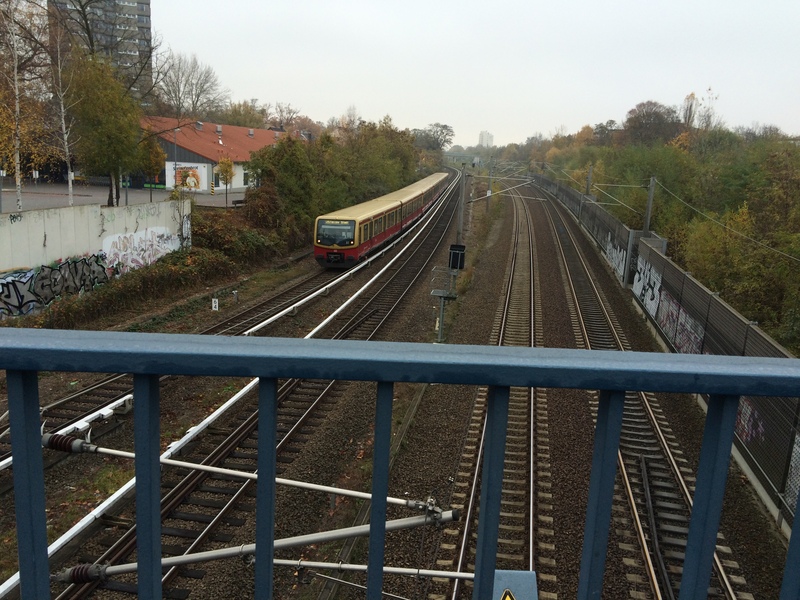 While I was living in Berlin, we never rode the S-bahn. Although there were one or two lines that Americans were allowed to ride, they would take you into E. Berlin at some point. So, most of us erred on the side of caution and only rode the U-bahn. There is a very funny story in our book entitled The S-Bahn Incident that points out the dangers and fears surrounding riding the S-Bahn. 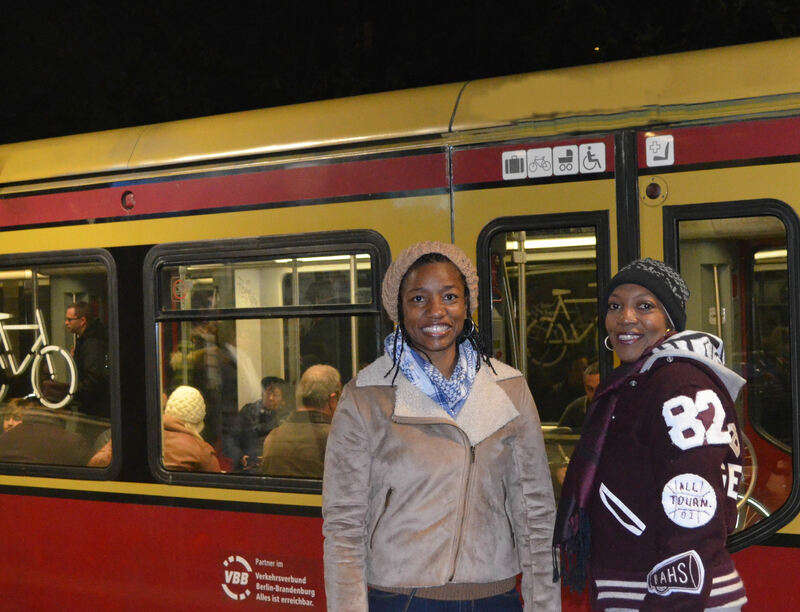 Although I had ridden the S-Bahn on previous visits to Berlin, this was Trisha’s first time to ride one, so it was pretty exciting. 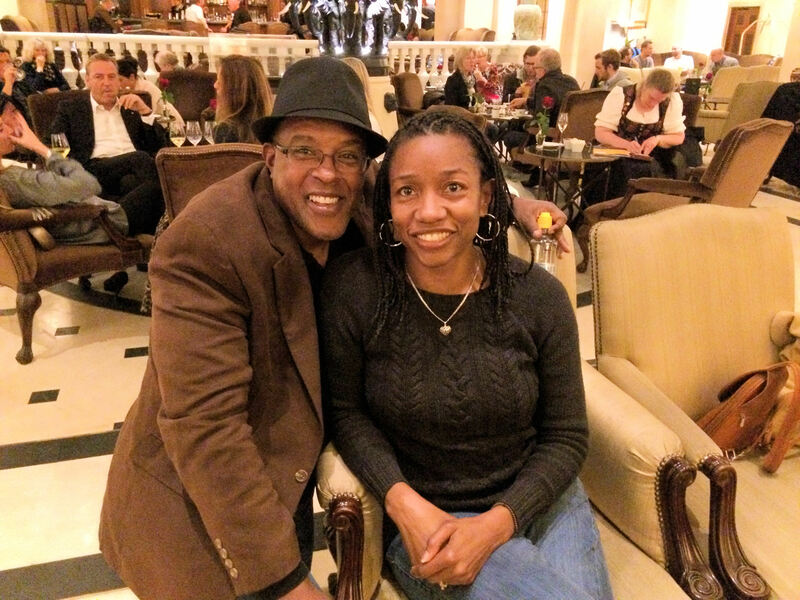 Anyway, one of my close friends, Bobby Harrell, who lives in Berlin, called me as soon as we arrived and insisted that we put our bags away and head down to the Adlon. I told him we were very tired and a long way from Mitte, but he’d gathered some of our classmates at the hotel and would not take no for an answer. So, we headed down the street to the nearest U-Bahn station which was about half a mile away, because the S-bahn, which was less than 50 feet from our front door, was still not running due to the strike. Halfway to the U-bahn, we got a call from Trisha that she was headed to meet us at our flat. She had arrived directly in Berlin, and had spent the day with Michael and his family. However, she didn’t have the key, so Ivan walked back to let her in. I continued on my way, not wanting to let my Brat classmates down, who were waiting for me at the hotel. Although it was late (after 10 pm) and I had to walk under a dark overpass and past several even darker alleys, I wasn’t too worried about being alone because I was in Germany. Violent crime is not as common as it is in my own metropolitan city. Although I’ve been warned since then, that just like the US, human trafficking is still a real threat. Since the U-bahn runs less frequently late at night, I had to wait a little longer than usual for the train. When it finally came, I realized I’d forgotten to buy a ticket! I was so tired I forgot! Even though mass transit works on an honor system, my knee-jerk reaction was to abide by the law and go purchase a ticket. It is rare that anyone ever checks– in fact I’ve never been checked–not when I lived in Berlin, nor on any subsequent trip. However, in a well-ordered society, where everyone plays by the rules, it doesn’t feel right not to, even if there is little accountability. Of course, in the time it took to run back up the stairs to buy a ticket, the train pulled off. I had to sit there for at least another 20 minutes. When I finally reached my destination– Zoologischer Garten (Berlin Zoo train station), I walked upstairs and out to one of the many bus stop signs. Zoo Station used to be the central bahnhof (train station) in West Berlin–it is also across the street from the Berlin Zoo. It was freezing! While waiting for the bus, I got a call from Ivan that he had already arrived at the Adlon. Our friend Michael had given him a ride after dropping Trisha off at the apartment. So, I waited, and waited in the cold. Turns out, the city’s usually frequent transit was further delayed not only by the strike and the late hour, but the buses going to the Adlon had been re-routed. In my last post, I mentioned that the city center is called Mitte– and that this area is home to Potsdamer Platz, Brandenburg Gate, Sony Center, the Berlin Film Festival, the Ritz-Carlton and the famous Adlon Hotel (which I blogged about here in 2012). Since this area would be the focal point for the 25th Anniversary of the Fall of the Wall celebration, part of the security measures was that no buses or bahns were traveling directly into it. I had to get off the bus about 2 city blocks away, then I started walking again. Ultimately, it took about 2 hours for what should have been just under an hour to to the hotel, and I was already exhausted from the flight. Even though I was tired, I was excited to go to the Adlon. I’d always wanted to visit the historic hotel, even before it became famous to Americans thanks to Michael Jackson’s baby-dangling fiasco. Despite the late hour, and my exhaustion, it turned out to be worth the trip, because we got to hang out with the wonderful people pictured below. One of the [many] unusual things about our high school reunions is that all our reunions are All Classes, All Years. Meaning, we don’t have separate reunions for different class years. Thanks to the transient life of military kids, your class year doesn’t necessarily reflect when you graduated from Berlin American High School, nor even when you attended. For example, my sister, whose class year is 1986, attended BAHS from 1980- 1983 (like my brother and I). That meant she attended middle school at BAHS since it was a 6th thru 12th grade school. She graduated high school in the US three years after leaving Berlin. However, I actually had the great privilege of graduating from Berlin American High School in 1983 before our dad was stationed back to the US. Thus, it’s just easier to have reunions open to everyone who ever attended. We do divide up some activities by decades (60s, 7os, 80s), but most of our weekend events are all years, all classes. What’s great about that is my friends above are all from various class years and decades! Robert, who is from the class of 1965–witnessed the Berlin Wall being built and people fleeing the city, as his family drove into Berlin in 1961. Robert and his sister both share stories about that historic time in our book. Liese, who also contributed a story to our book is class of 1983 like me; but I didn’t know her in school, because she lived in Berlin in the late 70s. Birgit is class of 1985, like my brother–I was friends with her older sister who is class of 1983. Marcel, class of 1984, was a shy guy in high school, but we became fast friends when we met again 19 years later on my first visit back to Berlin in 2002. I try to meet up with Marcel every time I’m back in town. Bobby and I are class of 1983 and had all the same friends– he dated one of my close friends– and Ivan and I stayed with him when we were in Berlin in the summer of 2006. 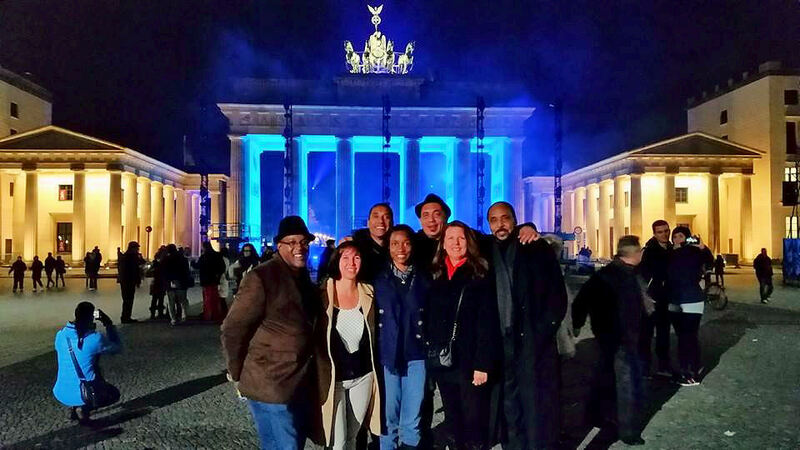 Since Bobby lives in Berlin, he is the tie that binds– he attended Berlin American High School and Thomas A. Roberts School (the US elementary school) his whole life. So, he likes to plan these get-togethers when we’re in town. When I visited Berlin in 2002 with some classmates, he called up all the local Berlin Brats he knew (those who still lived in Berlin) and even two of our dear teachers, Mr. Bluem and Herr Prigge. He put together a surprise gathering at a local Biergarten to welcome us, then later a party at his house [pictured above]. 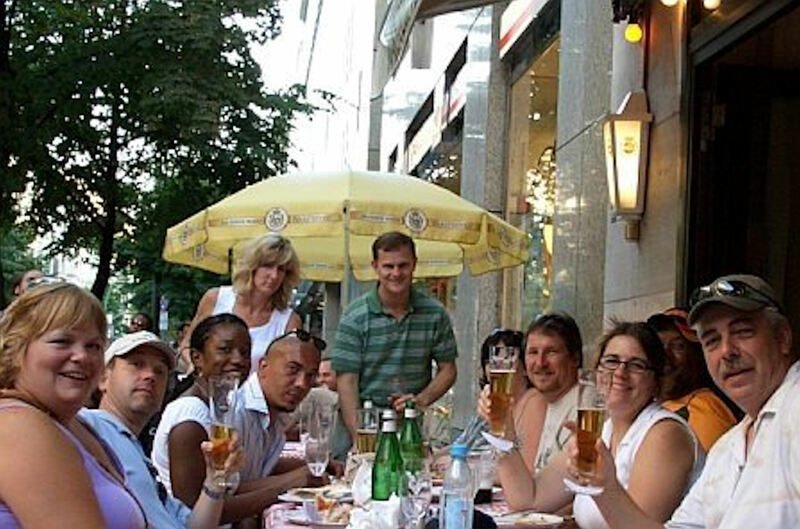 In 2006, when our alumni association had its first reunion in Berlin (they had always been in the US before that), he pulled together a party for several of us at a sidewalk cafe across the street from his apartment. When I visited in 2011, my sister, daughter and I were on a pretty tight schedule, but he did manage to get us together for a small gathering of friends for lunch. So, this is why I spent 2 hours trying to get to the Adlon– this is a tradition, when I come to town, Bobby pulls friends together for a hang out and/or a party. Actually, Bobby is now in marketing and events, so he’s doing what comes naturally to him. His parents used to own the famous Talk of the Town nightclub, so partying is in his blood [I wrote about the TotT here a few years ago]. This night was no different and he convinced all of us to essentially embark upon a club/bar crawl through east Berlin. Ultimately, we were too jet lagged to fully enjoy the experience. So after some time at his friend’s club, which he helped design, we all refused to go to a second club. Plus, Ivan and I hadn’t eaten in almost 12 hours, so our little rag tag group ended up at a Currywurst stand– Berlin’s iconic signature street food. By now it was close to 2 am and Ivan and I had been up for more than 24 hours; after some discussion, everyone else agreed they were ready for bed too. So, we all bid Bobby adieu, as he was leaving town later that morning. The rest of us would be enjoying the 25th Anniversary celebrations for the next few days and nights and needed our sleep. Ivan and I headed back to our apartment to get some rest for the upcoming weekend celebration! Yo. ..loved reading this. Might we use in the Newsletter???? Some how…I missed…or didn’t remember Bill Planz coming to your rescue! Does the heart good…to learn of all the NEW friendships across the class years!!!!! That in itself is a great testimonial for attending REUNIONS!!! You were so busy, planning an awesome reunion– overseas to boot– that you just forgot, but we did tell you at the time. I think it was via email. Anyway, you made it all possible, Jeri! You put Ivan and Bill together. I loved reading about your trip. Bobby and Marcel Harrell are old friends of my family. My dad, Vince Lombardo, was good friends with their parents, Bob and Christiana, when he was stationed in Berlin after Vietnam. Unfortunately, I haven’t seen or spoken to Bobby or Marcel in many years. I was hoping that you may be able to email me a current email address for them. Thanks.